Veterinary practices can fulfill client needs — and reduce inventory costs — by working with a vendor to ship drugs and food directly to the pet’s home. Transitioning to home delivery allows veterinary clinics to reduce their costs of goods. Today’s veterinary clients can easily go online or stop at a human pharmacy to purchase their pets’ pharmaceuticals. From their perspective, what could be simpler than filling a personal prescription and a pet’s prescription at the same time? Unfortunately, it means in-clinic veterinary sales suffer. Some practice managers looking for ways to bring lost pharmacy dollars back in-house are partnering with prescription-fulfillment companies to offer clients an online shopping experience customized to the individual clinic. Providers set up a personalized website for the clinic through which clients can order pet medications and even therapeutic pet food. A clinic veterinarian approves all drug orders before they are shipped. “Our online stores allow veterinary practices to reduce overhead and expand product availability, without the need to physically stock every item,” said Christy Fox, online store coordinator for Midwest Veterinary Supply in Lakeville, Minnesota. “Each practice’s online store is unique, as the clinic chooses which products to offer and is able to customize the pricing for those items, so they’re fully in control of their profit margins. In general, cost and convenience are the two main reasons that clients shop outside the clinic. Many clients get product recommendations from their veterinarian, walk out the door and buy the pet medications elsewhere. A veterinary professional might think that all clients buy elsewhere strictly for the cost savings, but that assessment isn’t necessarily true. Many clients value convenience just as much as price. They are used to shopping online for everything from clothes to electronics. They don’t have to drive to the store, park and shop. The items show up at their door within a few days at most. “Price can sometimes sway a client to make a purchase, but it’s really convenience that drives that behavior,” said Kristin Dance, VMD, senior key account manager at Portland, Oregon-based Vetsource, which offers online pharmacy and home-delivery services for veterinary hospitals. Home-delivery services allow clinics to streamline their on-hand inventory and offer more variety. Practice manager Stephanie Goss helped transition two Washington State clinics — Chimacum Valley Veterinary Hospital and Pet Townsend Veterinary Clinic — to home delivery through Vetsource. Transitioning to home delivery allowed the clinics to reduce their costs of goods. Home delivery can be an appealing option with therapeutic diets, especially food packaged in heavy bags or multiple cans. delivery services set up automatic refills, which increases compliance without the need for the client to remember to order the drugs. Midwest Veterinary Supply takes the concept one step further with a monthly service called Easy Dose It. 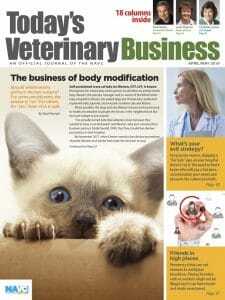 Midwest Veterinary Supply offers several online platforms for practices: MyVetStoreOnline for companion animals, MyEquineStoreOnline for horses and MyPharmStoreOnline for food animals. Another way to increase compliance while keeping spending at the clinic is to capture the business when the veterinarian recommends a product or writes a script. Vetsource’s mobile app makes it easy for clinic staff to use a tablet computer to enroll clients in home delivery when they are in the exam room or at checkout. Providers of home-delivery services typically offer more benefits than simply filling pharmacy orders. For instance, the Vets First Choice platform also helps clinics manage prescriptions and identify missed opportunities. Although additional costs are associated with using a home-delivery website, practices can see a reduction in pharmacy expenses, including the need to pay someone to track, order and unpack the inventory and stock it on the shelves. Deciding how much to charge for a drug or diet is made easier with templates, which reveal the average online price of popular products. Goss, who has used Vetsource at three clinics, said home delivery had a positive impact each time.